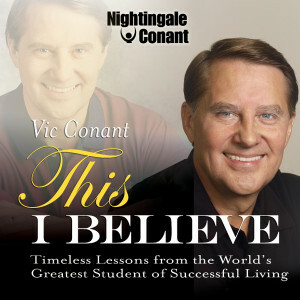 Vic Conant is the Chairman of the Board of Nightingale-Conant Corp, the premier publisher of audio personal development programs in the world.Vic had the great fortune of growing up surrounded by the works of the modern legends of the motivation industry like Napoleon Hill, Earl Nightingale, Dale Carnegie and Norman Vincent Peale to name a few. His Dad, Lloyd, used to have a speaker in every room of the house, including the bathroom. Vic recounts, "When Dad played Earl Nightingale's recordings you listened no matter what you were doing!" After graduating from the University of Michigan and a stint in Viet Nam, Vic eventually joined the family business just as it started publishing other authors besides Earl Nightingale-the first of whom was Denis Waitley and eventually the Whose Who of business and self improvement.Vic took over as president and in 1986 and has spearheaded its growth to over $40mm in sales making it by far the dominant publisher in its field.Vic has undoubtedly worked with more of the great self-improvement authors than any other human being alive today. And when an upcoming author in the human potential field wants to get published it is just natural for him or her to seek out Vic and Nightingale-Conant.